Introduced to golf by her father, Al, at the age of nine, Pitcock graduated from the courses of Fresno to international competition and to win nearly $1.3 million on the LPGA Tour during a career spanning 17 seasons. The highlight of her professional career was winning the Jamie Farr Classic by a single stroke during her ninth year on tour in 1996. Pitcock shot 9 under par over 54 holes, including a 1-under-par-70 during the final round. _Pitcock showed how well she would play the game early on. She became a two-time American Junior Golf Association All-American and, by the age of 15, already had won the California Junior Amateur and competed in her first U.S. Women's Open. 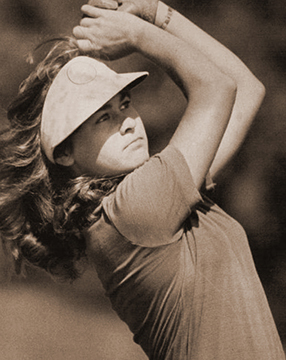 At age 17, she won the Optimist Junior World Championship and was the low amateur in the U.S. Women's Open. In 1994 and 1995, the Clovis West High School graduate represented the LPGA at The Nichirei International, an event pitting America's best women golfers against Japan's best women golfers. She went 2-0 in her singles matches, a record that Pitcock ranks among her most cherished golfing memories and accomplishments. _Pitcock joined the LPGA Tour in 1987, shooting a career-low round of 63 in her rookie season. Her best seasons came in 1995, when she eclipsed $200,000 in earnings, and 1996, when she won more than $190,000 -- and the Jamie Farr Classic. She finished in the Top 20 of LPGA majors nine times, highlighted by a seventh-place performance in the 1991 U.S. Women's Open. Pitcock posted 23 Top 10 finishes in her professional career. _After retiring from the tour, Pitcock remains active in golf, traveling the country to participate in charity-related events and championing the Susan G. Komen Breast Cancer Foundation.